Homewood’s girls won their third consecutive 6A crown totaling 124.5 points. Journal photo by Jordan Wald. 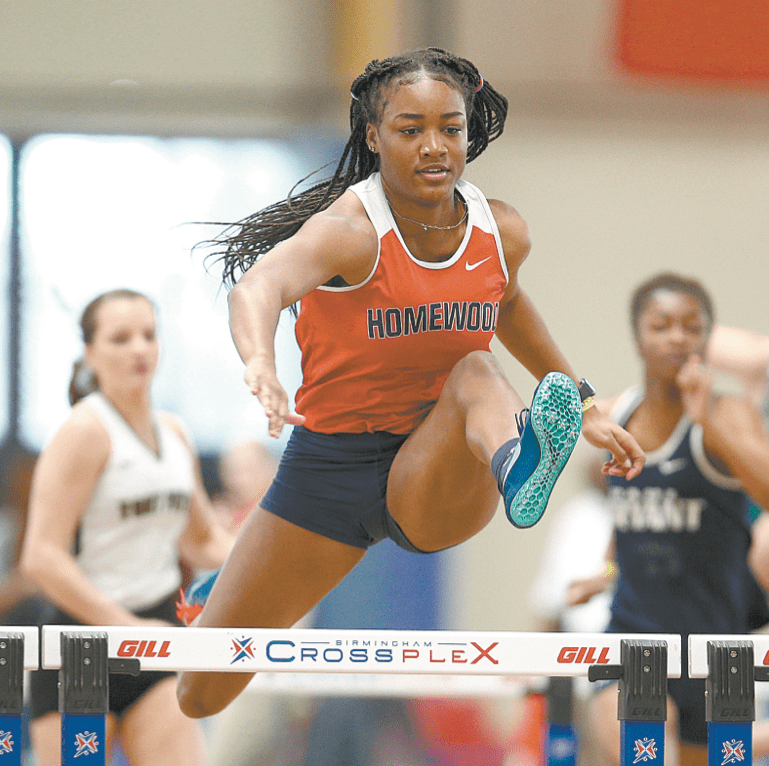 Although Makiyah Sills had competed for the Homewood girls track and field team since the eighth grade and been part of several state championships, she had not won an individual crown. That changed for the Patriots’ senior Saturday at the 49th AHSAA State Indoor Track & Field Championships at the Birmingham CrossPlex. Makiyah Sills, above, won 60-meter hurdles with a time of 8.91 as Homewood won its third consecutive Class 6A team title. Journal photo by Marvin Gentry. Sills won 60-meter hurdles with a time of 8.91 as Homewood won its third consecutive Class 6A team title. “I couldn’t believe it,” Sills said. “I am new to the short hurdles. I’m proud that all the work I put in paid off. Homewood amassed 124.5 points, easily outdistancing second-place Pelham (95 points) and third-place St. Paul’s Episcopal. Coach Tom Esslinger’s Patriots also captured the boys Class 6A title for the second year in a row and the fifth in the past seven years. Homewood was the only school to capture boys’ and girls’ crowns. Will Stone, right, swept the Class 6A distance events. Stone won the 800-meter run in 1:56.14, the 1,600 in 4:24.55 and the 3,200. A few days before the meet, Sills was somewhat apprehensive. “In the back of my mind I am nervous, but I am sure everything will be fine,” she said. It was more than fine. Esslinger was especially happy to see Sills pull it off. “She really is a coach’s dream,” Esslinger said. “She listens especially well and she comes out and goes to work every day. Sills finished second in the 60-meter dash with a time of 7.72, leading a strong contingent of girl athletes for the Patriots. Aiya Finch won the long jump (18-05.50) and triple jump (39-01.25); Edie Smith won the 3,200-meter run (11:44.13) and was third in the 1,600; Alex Brooks won the pole vault (11-08.00) and Brooke Walden was third (10-00.00); and Maggie White won the shot put (37-11.50). The Patriots also excelled in the relays, taking first in the 4×400 (4:15.81), second in the 4×200 (1:48.29) and third in the 4×800 (10:12.31). The Patriots boys won their second Class 6A title in a row and their fifth in the last seven years. Journal photo by Jordan Wald. The Homewood boys totaled 95.5 points. Northridge finished second with 83.5 and Opelika was third with 78. Patriots senior Will Stone swept the Class 6A distance events. Stone won the 800-meter run in 1:56.14, the 1,600 in 4:24.55 and the 3,200 in 9:35.34. “That’s a tough thing to do, to win all three distance races in one meet,” Esslinger said. “He’s probably the most solid and competitive kid I’ve ever had. He’s so dominant it’s unbelievable. Stone was the only Homewood boy to win an individual state championship, but some others performed well. Logan Justice finished second to Stone in the 800 (1:59.84), Stephon May took second in the high jump (6-06.00), Eli Brooks finished second in the pole vault (13-00.00) and Sam Dill was third in the long jump (21-01.75). Homewood also finished first in 4×800 relay with a time of 8:11.84.